Your cat will love this one! Luxurious and comfortable cat tree which includes 2 condos, 3 plush perches with raised edge and a sisal-covered slope adds so much more fun for playtime. Description: Your cat will love this one! 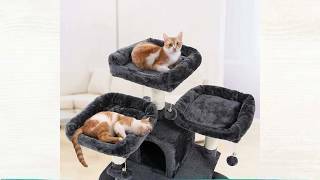 Luxurious and comfortable cat tree which includes 2 condos, 3 plush perches with raised edge and a sisal-covered slope adds so much more fun for playtime.